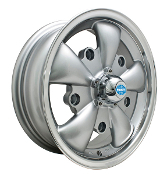 The "Classic" wheel that will never go out of style. 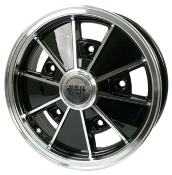 Gloss black with polished lip and spokes. 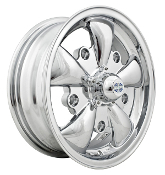 Takes 60 degree style lug nuts. 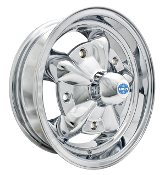 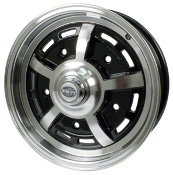 5"wide wheel has 3-7/8" backspacing and fits the "Wide 5" style VW bolt pattern: 5 lugs on 205mm. 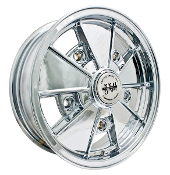 Comes with cap and chrome valve stem. 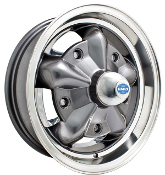 The "Classic" wheel that will never go out of style. 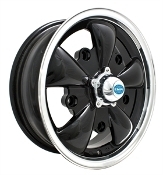 Matte black with silver lip and spokes. 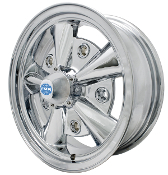 Takes 60 degree style lug nuts. 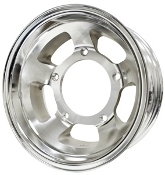 5"wide wheel has 3-7/8" backspacing and fits the "Wide 5" style VW bolt pattern: 5 lugs on 205mm. 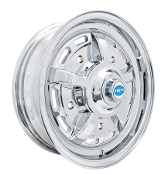 Comes with cap and chrome valve stem. 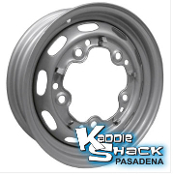 Tired of looking at your old, rusty wheels that don't hold the hubcaps on anymore? 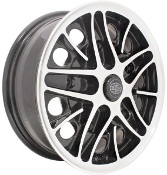 Here's your answer. 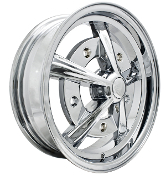 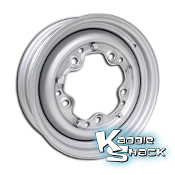 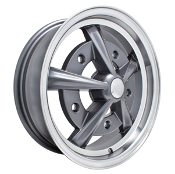 We have quality stock OEM-look steel wheels available in silver metallic finish for 5 x 205mm VW bolt pattern. 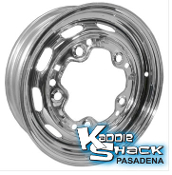 There are also two wheel widths to choose from: 4.5" or 5.5" Tired of looking at your old, rusty wheels that don't hold the hubcaps on anymore? 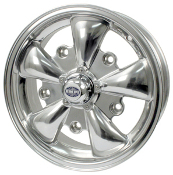 Here's your answer. 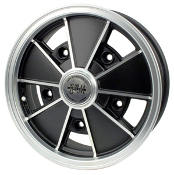 We have quality stock OEM-look steel wheels available in silver metallic finish for 5 x 205mm VW bolt pattern. 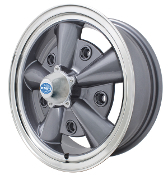 There are also two wheel widths to choose from: 4.5" or 5.5"